When I first heard of InboxDollars, I thought it was either a scam or probably not worth my time. Then I slowly heard good things about InboxDollars from others who tried it. However, I started hearing more cons than pros about the app. 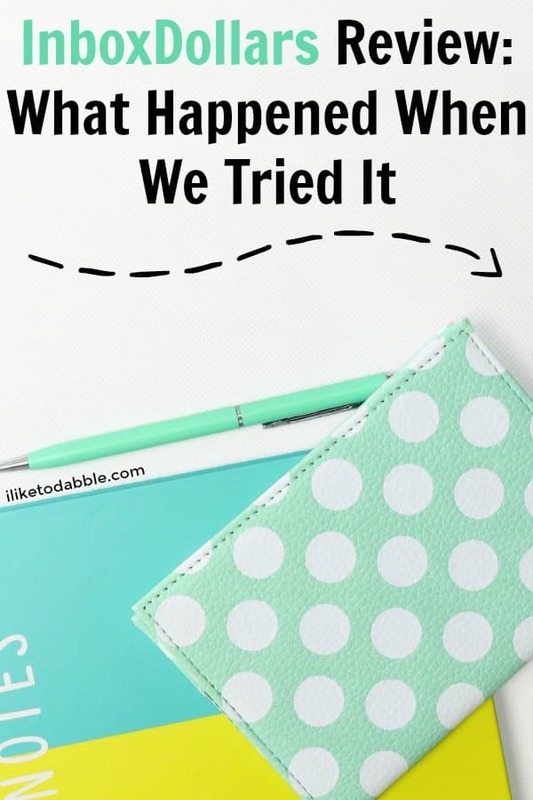 I had tried it years ago but I know some things had changed on the app since then, so I reinstalled it and started my trial run for this InboxDollars review. Is InboxDollars actually legit or is it a scam? We found out for ourselves. 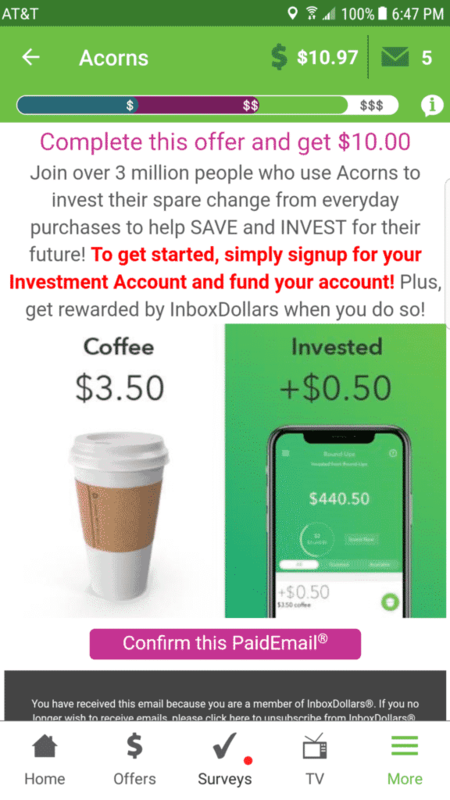 As you might have seen in InboxDollars advertisements, they pay a $5 bonus to the user just for signing up. This is how they draw users in to sign up and install their app and honestly, they drew me in with that incentive too. I don’t know what it is but I fall for that same incentive with most apps 99% of the time. The sign up process is easy. I chose and entered my name, email and password which prompted me to verify an incoming email from InboxDollars. But that $5 doesn’t come immediately after sign up. They pay the $5 to your InboxDollars account once you complete your profile survey. Thankfully, that survey only takes about 10 minutes, at the most. And you are easily prompted for the profile survey on the dashboard once you create your InboxDollars account. The profile survey consisted of several questions pertaining to anything from basic information such as my name, age and race to a little more private information such as housing ownership, household income and medical history. After I completed the profile survey, lo and behold! There was a magic $5 in my InboxDollars account. Click here to download/register the Android app for InboxDollars, free $5 bonus included. Click here to download/register the IOS app for InboxDollars, free $5 bonus included. What can you earn money for on InboxDollars? You can earn money for a variety of activities through the app. Some of the activities have an actual payout for completing them and others award you points towards scratch offs and wheel spins that hold the actual cash prize. How much money can you actually earn, realistically? To my surprise, after 1 hour of installing and registering for InboxDollars, I earned $10.97. This was probably because I dedicated a lot of that hour to completing various offers and surveys on InboxDollars (along with other household chores and multitasking). I will warn you, not all the activities are paid out equally and some can be a real waste of time. So choose what you do on the app wisely for the best possible cash outcome. However, the app will not pay out any of the earned rewards until your account reaches a threshold of $30. Good thing it isn’t that hard to get to $30, but it will take time. When watching the videos and ads on InboxDollars along with playing the arcade games, you don’t get paid out for those activities. Instead you are paid out with ‘progress’ towards your next scratch off or wheel spin. When you complete the three tiers of progress, you get a scratch off unlocked. Most scratch offs hardly pay over $0.25 though. Same thing with games and the wheel where I spent more time for a smaller payout. Below is a screen shot of one of my scratch offs, back when I was still at $6.05 in my InboxDollars account. The best paying opportunities on InboxDollars that I found were completing offers or downloading other apps for a payout, as you can see above from my activity on the app. 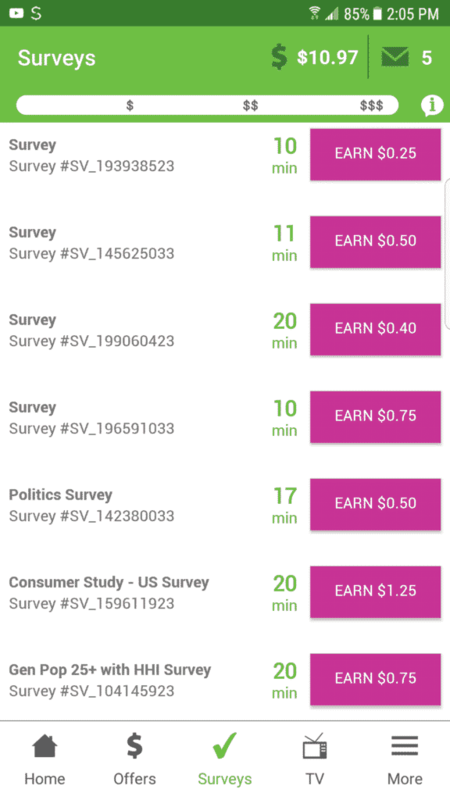 I only found one semi high paying survey on the app and that was for $2.25 to complete a 20 minute survey. When I went to try to take that specific survey though, I did not qualify to complete it after a couple of simple questions about what type of car I drive. But I received $0.25 for a shorter and simpler survey they recommended following the rejection of my qualification. 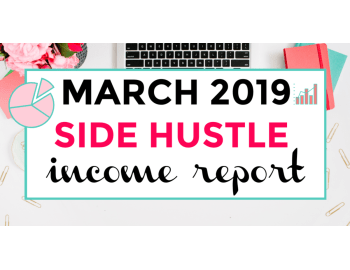 You will see that often with the InboxDollars surveys offered some days where the higher paying ones are harder to qualify for. It is all based on your demographic, I guess. 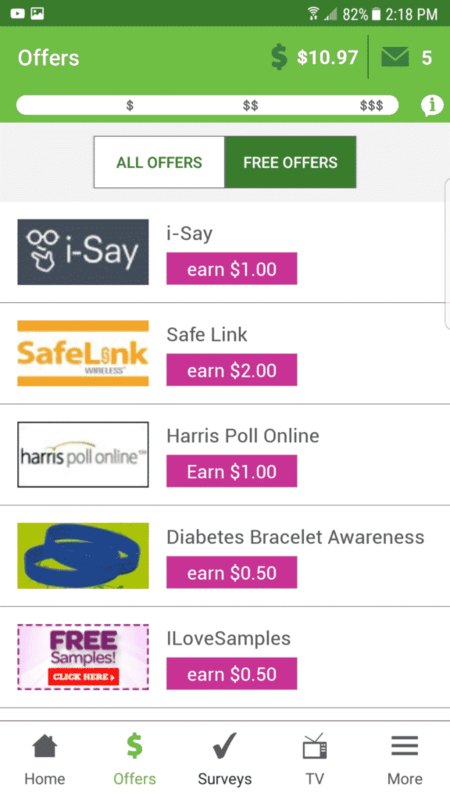 The pros of InboxDollars is that the app is very well organized when comparing the other survey websites and apps I have used in the past. The categories are easily stated, easy to find, and easy to navigate with very little delay or slow downs. The payouts from activities are almost instant to the InboxDollars account unless they are from an app download. Then they will come anywhere from 20 minutes later to a couple of days later. 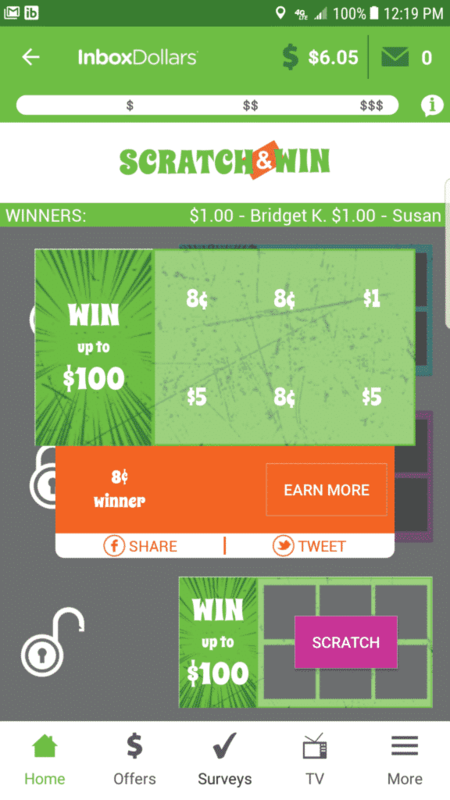 I also like that this app rewards you for your activity in actual dollars and not points, like another well known similar platform SwagBucks. There are plenty of apps out there similar to both of these apps and even they don’t pay you out in actual dollars. I have come across too many consumer survey sites where I thought I would get paid out in actual money, but instead were ‘rewarded’ with a gift card from either Amazon, Target, etc. So, Kudos to you InboxDollars, for the ACTUAL money. In addition to some cons that kind of came out before in my initial assessment (as you can read about above in the post), there are a couple more pain points that I couldn’t help but noticing. I am not very happy about the $30 income threshold before I can withdraw my earnings from InboxDollars. I am sure there is a reason for this but it can be challenging to reach that threshold. It isn’t impossible though and I will have a pretty good chance of reaching that threshold this week if I continue to download apps from their free offers area of the app. Another con of this app is that it can appear to spam your email inbox. This is because of the InboxDollars inbox being linked to the emails they send you. You see, every day InboxDollars sends these ‘paid emails’ for you to confirm in your InboxDollars inbox (on the app). These are just emails where you literally click a button saying confirm and you get progress towards another scratch off. Well these emails are also sent to your actual email that you gave InboxDollars too. So be sure to unsubscribe from those emails so you are bombarded with constant InboxDollars emails on your gmail or whatever you use on your phone. Below is a screen shot of one of the ‘Paid Emails’ that you would see in the InboxDollars app to confirm. These emails also get sent to your email inbox so unsubscribing to them and only using them in the app makes things easier, at least for me. 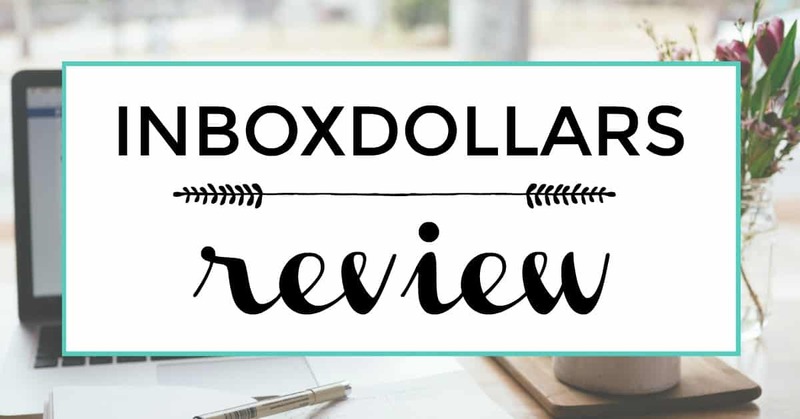 InboxDollars Review Conclusion: Is InboxDollars worth your time? As you can see, you aren’t going to make thousands of dollars with this app. And you are definitely not going to create a second job or legit side gig with using InboxDollars either. The amount that you will earn through the app won’t be a substantial enough supplement for your income, but it still can help. 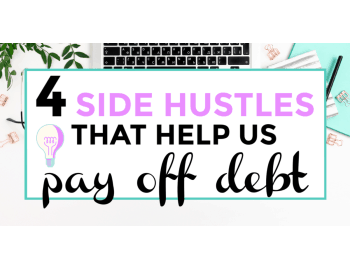 Depending on the time you have and how much you like playing on your phone and completing these types of activities will tell you how much you can earn in your spare time. Once you hit that $30 threshold, that is enough for a free dinner or the trash bill, at least! I mean, in most cases isn’t $30 better than $0? Have you tried InboxDollars? What were your own experiences? We would love to hear from you in the comments below! Swagbucks: Swagbucks is where you can earn points called swagbucks or SB that transfer into real dollars. Earn money by taking surveys, shopping online, watching videos, discovering content or downloading other apps. Every 100 SB = $1.00 USD. Get a $5 bonus when you sign up! Install the Swagbucks Swagbutton extension to your chrome browser here and get a $10 bonus! Panel App: With the Panel App you can earn points for taking surveys and referring others. Those points can then be used to enter sweepstakes or redeem for cash and gift cards.